Please help stop this catastrophic project. For Immediate Release: April 22, 2009. Texas billionaire McCombs ‘discovers’ pristine and endangered habitat; plans exclusive golf course and resort catering to foreign millionaires. 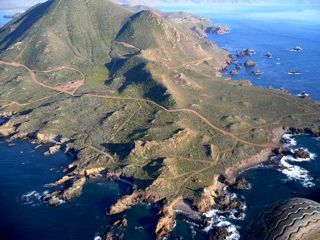 Punta Banda is the point located on the tip of Ensenada Bay, Baja California, Mexico. It is one of the last remaining areas of endangered maritime coastal scrub habitat and the site of countless prehistoric and historic archeological sites. This spectacular landscape—often compared to California’s Big Sur–boasts sea bluffs, caves, coastal terraces and wondrous tide pools creating a unique coastal environment in the region. Its cultural and archeological significance has been documented by the international scientific community and Mexico’s National Institute of Anthropology and History (INAH), and visits to the site have long been a tradition for local and foreign peoples alike. The beauty of this site has attracted Texas billionaire B.J. “Red” McCombs, who ironically hopes to dynamite the area and create an exclusive golf course and resort. Prices for these homes range from 3 to 10 million dollars; helicopter flights will allow the elite clientele to take a short ride from San Diego to the resort. Infrastructure needs for the golf course include copious amounts of water which are unavailable in this arid region. The project foresees a desalination plant which will discharge huge quantities of salt sludge directly into the bay. This brine has the potential of affecting water quality and the whole marine ecosystem. McCombs has a history of siting projects in pristine areas which have lead to opposition and litigation; one example is Wolf Creek in Colorado, where permitting processes have been successfully stalled by local communities. In the case of Punta Banda McCombs is relying on the reputation and stature of international golf celebrity Tiger Woods to promote the development. However possible losses of the cultural heritage at the site, as well as the environmental fragility are major issues, and have provoked strong resistance from the Ensenada community, which is keeping a close eye on the permitting process. At recent public hearings related to the project, local scientists, community members and activists pointed out numerous glaring flaws and inconsistencies in the environmental impact report presented by the promoters, leading the government’s Environmental Secretariat (SEMARNAT) to request additional information. While Punta Banda is known for its archeological significance, the INAH, the federal agency in charge of all cultural and historic preservation in Mexico, has shown little interest in sites without pyramids or monumental architecture, granting developers quick, low cost permits with minimal mitigation. A project of similar dimensions in the developers’ own country could easily take years and millions of dollars to complete; in this case it is not yet clear what plans the INAH’s federal bureaucracy has for its archeological “salvage” project. Although the Mexican Constitution guarantees the right of Mexican citizens to direct access to the coast, local residents have been alarmed to find that the area has been fenced off, denying all access. Additionally local residents have pointed out that municipal land use ordinances for the area do not allow the construction of this type of development in this fragile zone, and yet the permitting process continues. Local community leaders, scientists, residents and activists fear the loss of cultural and natural heritage at Punta Banda. The resort as planned would destroy acres of archeological sites as well as fragile coastal and marine ecosystems home to sea lions, harbor seals and peregrine falcons. This week Tiger Woods will be receiving over 200 letters and petitions written by local residents and organizations. The community is calling on Tiger Woods to withdraw his support of this project, to consider the enormous value of the area for future generations and to collaborate in the creation of a nature preserve which would protect the archeological sites and ecological integrity but also allow for appropriate public use and enjoyment of the area, including hiking in the area’s spectacular landscapes, exploring caves, kayaking, rappelling, sightseeing and scientific research in this rich biodiversity area. “This area must be protected not only for Mexican citizens but for the whole world to benefit from its magnificent landscapes, wildlife and cultural heritage” said Mercedes Armendariz, local resident of Punta Banda. Surely no one featured in this article already lives in a home exploiting the region’s landscapes, wildlife and cultural heritage? People who live in glass houses(perched over the ocean… and the sewage goes where? )… should not throw stones. I couldn’t agree more. Projects like this are a travesty. Aren’t there already enough golf courses in areas where there is adequate fresh water? Why do wealthy golf course developers have to exploit fragile tropical and arid areas? Hopefully, Tiger Woods will have the balls (bad pun intended) to withdraw his support.